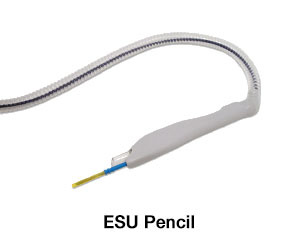 The electrosurgical unit (“ESU”) “pencil” wars are heating up now that both the short and long-term health hazards caused by inhaling surgical plume have been accepted1,2. Perioperative nursing groups and various industry leaders have led the way in educational efforts aimed at clinicians, hospital administrators and even state politicians. Covidien, Stryker, Conmed and Buffalo Filter to name a few, have promoted their various “pencil” designs but without offering coincident documentation of device functionality. Their market segmentation has often been muddled so that sales most often have reflected their multiproduct and financial negotiations. Administration has been educated to their huge financial liability associated with potential workman compensation claims that would likely occur as employed clinicians learn of the relationship between their chronic exposure to surgical plume and their current health status3. The guidelines offered by OSHA, AORN, TJC and, most recently, ISO 16571 issued in 2014, have caused healthcare systems to be proactive in protecting their employees from surgical smoke inhalation. From the above, we can understand why hospitals are self-mandating smoke evacuation policies while in California, the OSHA Standard’s Board has forwarded an approved petition for a state-wide smoke evacuation mandate to their Rules Committee. The Committee is tasked with establishing the minimum standard for smoke capture efficiency for their operating rooms; an efficiency great enough to protect the health of both workers and patients. It is anticipated that they will publish the standard within the next six (6) months incorporating the ISO 16571:2014 minimum standard of 90% smoke capture efficiency as documented by the manufacturer based on independent laboratory testing4. Hospitals with policies now in place see COMPLIANCE as their primary focus so as to offset any future liability making them choose between compliance and actual clinical value. They would prefer to purchase both but where is the data to support use of the “pencil?” In what hospitals see as a lack of a better alternative, the “pencil,” in any of its variations, is their ONLY choice. “Not so,” says Nascent Surgical. In our next posting, we will state our case for the value proposition of the miniSquair® surgical smoke and bioaerosol capture device. Ball K. Compliance with surgical smoke evacuatiation guidelines: implications for practice. AORN J. 2010; 92(2): 142-149. Buzea C, Pacheco II, Robbie K. Nanomaterials and nanoparticles: sosurces and toxicity. Biointerphases 2007; 2(4): MR 17-MR 71. ISO 16571:2014. “Systems for evacuation of plume generated by medical devices.” Published March 15, 2014, Geneva, Switzerland.